Sumona Saha, MD is an assistant professor of medicine at the University of Wisconsin School of Medicine and Public Health. She is board certified in internal medicine and a specialist in Gastroenterology. She is the first physician in the country to complete a training program in gastroenterology with a specific focus on women's health. She is a member of the American College of Physicians, American Gastroenterological Association and the Crohn's and Colitis Foundation of America. Her clinical interests are in inflammatory bowel disease and GI disorders in pregnancy. 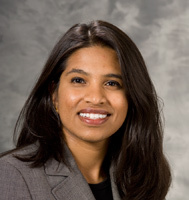 Dr. Saha is also a scholar with the Center for Women's Health Research at the University of Wisconsin and is funded by the NIH to conduct interdisciplinary research on women with inflammatory bowel disease.